X-ray binaries are a class of binary stars that are luminous in X-rays. The X-rays are produced by matter falling from one component, called the donor (usually a relatively normal star), to the other component, called the accretor, which is compact: a white dwarf, neutron star, or black hole. The infalling matter releases gravitational potential energy, up to several tenths of its rest mass, as X-rays. The lifetime and the mass-transfer rate in an X-ray binary depends on the evolutionary status of the donor star, the mass ratio between the stellar components and their orbital separation. (Hydrogen fusion releases only about 0.7 percent of rest mass.) An estimated 1041 positrons escape per second from a typical hard low-mass X-ray binary. X-ray binaries are further subdivided into several (sometimes overlapping) subclasses, that perhaps reflect the underlying physics better. Note that the classification by mass (high, intermediate, low) refers to the optically visible donor, not to the compact X-ray emitting accretor. A low-mass X-ray binary (LMXB) is a binary star where one of the components is either a black hole or neutron star. The other, donor, component usually fills its Roche lobe and therefore transfers mass to the compact star. The donor is less massive than the compact object, and can be on the main sequence, a degenerate dwarf (white dwarf), or an evolved star (red giant). Approximately two hundred LMXBs have been detected in the Milky Way, and of these, thirteen LMXBs have been discovered in globular clusters. The Chandra X-ray Observatory has revealed LMXBs in many distant galaxies. A typical low-mass X-ray binary emits almost all of its radiation in X-rays, and typically less than one percent in visible light, so they are among the brightest objects in the X-ray sky, but relatively faint in visible light. The apparent magnitude is typically around 15 to 20. The brightest part of the system is the accretion disk around the compact object. The orbital periods of LMXBs range from ten minutes to hundreds of days. An intermediate-mass X-ray binary (IMXB) is a binary star system where one of the components is a neutron star or a black hole. The other component is an intermediate-mass star. A high-mass X-ray binary (HMXB) is a binary star system that is strong in X rays, and in which the normal stellar component is a massive star: usually an O or B star, a Be star, or a blue supergiant. The compact, X-ray emitting, component is generally a neutron star, black hole, or possibly a white dwarf. A fraction of the stellar wind of the massive normal star is captured by the compact object, and produces X-rays as it falls onto the compact object. In a high-mass X-ray binary, the massive star dominates the emission of optical light, while the compact object is the dominant source of X-rays. The massive stars are very luminous and therefore easily detected. One of the most famous high-mass X-ray binaries is Cygnus X-1, which was the first identified black hole candidate. Other HMXBs include Vela X-1 (not to be confused with Vela X), and 4U 1700-37. 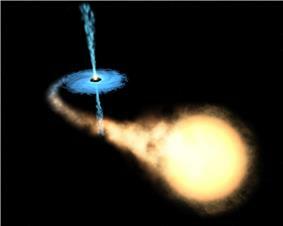 Artist's impression of the microquasar SS 433. A microquasar (or radio emitting X-ray binary) is the smaller cousin of a quasar. Microquasars are named after quasars, as they have some common characteristics: strong and variable radio emission, often resolvable as a pair of radio jets, and an accretion disk surrounding a compact object which is either a black hole or a neutron star. In quasars, the black hole is supermassive (millions of solar masses); in microquasars, the mass of the compact object is only a few solar masses. In microquasars, the accreted mass comes from a normal star, and the accretion disk is very luminous in the optical and X-ray regions. Microquasars are sometimes called radio-jet X-ray binaries to distinguish them from other X-ray binaries. A part of the radio emission comes from relativistic jets, often showing apparent superluminal motion. Microquasars are very important for the study of relativistic jets. The jets are formed close to the compact object, and timescales near the compact object are proportional to the mass of the compact object. Therefore, ordinary quasars take centuries to go through variations a microquasar experiences in one day. Noteworthy microquasars include SS 433, in which atomic emission lines are visible from both jets; GRS 1915+105, with an especially high jet velocity; the very bright Cygnus X-1; and the microquasar candidate LS I +61 303, which has been discovered to emit VHE (Very High Energy) gamma rays. Extremely high energies of particles emitting in the VHE band might be explained by several mechanisms of particle acceleration (see Fermi acceleration and Centrifugal mechanism of acceleration). ^ Introduction to Cataclysmic Variables (CVs), NASA, 2006.